We are excited to announce that next month, on the 1st & 2nd March 2017, we will be exhibiting at The Event Production Show, stand C25E. EPS is the UK’s leading exhibition for the live event sector, at London’s Kensington Olympia. Event Projection will be showcasing some of our recent and most exciting projection mapping work. We would love to speak to you about how we can help bring your next event to life with the latest projection mapping technology. 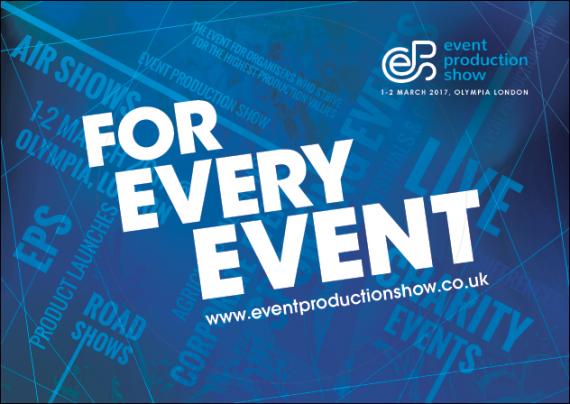 The Event Production Show is vital for anyone involved in the planning, organising and implementation of indoor and outdoor events. Whether they are music, sporting, charity, corporate, cultural or experiential events, EPS is For Every Event. It is the place to fulfil all of your event infrastructure needs. Click here to register for your fast track entry badge. Alternatively, contact one of the team to book an appointment with us for an informal chat over a drink on stand C25E. Email us on info@eventprojection.co.uk or call 020 7232 1748. The show is open from 9.30am – 5.30pm on Wednesday 1st & Thursday 2nd March, 2017. It is co-locating with the International Confex and the Office* Show, all at Olympia London. If you are planning any type of large event, film or TV shoot or ad campaign then come along and talk to us. We will be on stand C25E, ready to show you how we can help bring your ideas to reality. Register Now.